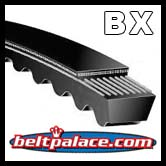 BX30 Industrial Grade Molded Notch V-Belt. BX Series. 33" L x 0.66" W. Classic Cogged (Molded Notch) BX-30 V-Belts deliver superior grip around smaller pulleys and keep pulleys cooler during use. INDUSTRIAL GRADE. BX30 V-Belt. Consumer Brand. COGGED BX30 Industrial V-Belt. 21/32” (5/8”) Wide x 33” Length OC. 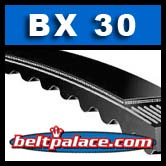 Replaces Standard Raw Edge B30, 5L330 FHP V-Belts. B30 Industrial V-Belt. B Section. 33" Length, 0.66" Wide V-Belt. BX29 Belt. COGGED BX29 Industrial V-Belt. 21/32” (5/8”) Wide x 32” Length OC. Replaces Standard Raw Edge B29, 5L320 FHP V-Belts. BX31 V-Belt. Consumer Brand. COGGED BX31 Industrial V-Belt. 21/32” (5/8”) Wide x 34” Length OC. Replaces Standard Raw Edge B31, 5L340 FHP V-Belts.